I've thought for a while that it would be a good choice in front of the bunny room as a "don't mess with Texas" measure. Our landscape designer went a bit rogue in that area and didn't plan for anything in front of the windows, instead opting for a single "patio tree" (any of several varieties of flowering bush trained into a tree shape, planted in a pot...not that she ever explained it to us that way) in the nook in front of the bunny room, but that would leave a lot of bare dirt in that area (and we really like the idea of a thousand thorns in the shins of anyone who tries to mess with the bunnies). The area is tricky because it gets almost no direct sun, but we thought it was still worth trying, so we picked up two one-gallon barberry plants for the space. Not knowing anything about anything horticultural, I depend on the tags that come with plants for instruction. I read them religiously, keep them in a binder for future reference, and follow their directions to the letter. (The one exception is that, most of the time, the sizes indicated on the tags are national averages, and it's often the case that plants won't get as big in our difficult climate.) 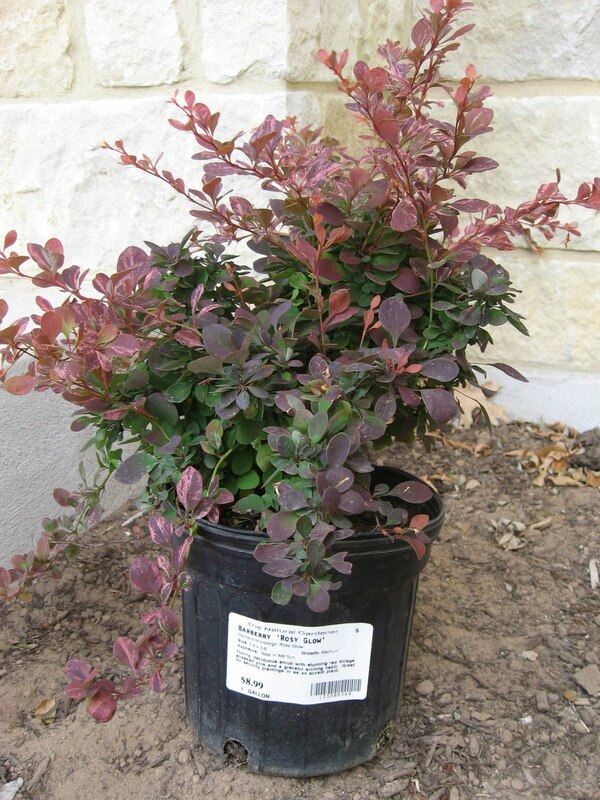 So when the time came to plant the barberry plants, I sought guidance from the tag and was frustrated to find three separate sets of size information. The label on the pot says it will grow to 3-6' tall by 3-6' wide.